They’re quick and easy, and just might save your career! This past Wednesday, millions of people said these words as they referenced the reality that awaited them once they pulled the covers back and their feet hit the floor. Now that the various holidays celebrated this time of the year are over, it’s time to look to the future—creating and executing against new goals, paying off holiday debt, and devising ways to enjoy the job more, to name a few. For those who really want to improve their work experience, one of the top reasons why is stress. 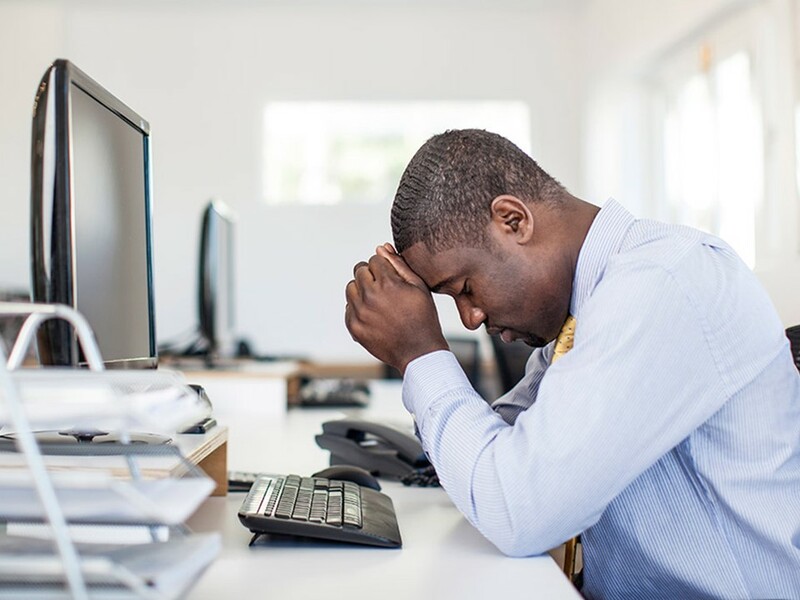 According to The American Institute of Stress, stress at work is the largest source of stress for American adults, and has increased over the last few decades. Sadly, a report by the United Nations’ International Labour Organization states that work-related stress around the globe is no better. Stress at work is the largest source of stress for American adults, and it’s not any better globally. A little stress has been proven to be good—it challenges people to be more alert and attentive, make decisions, and produce results. However, too much stress can have the opposite effect. Decision making becomes more difficult due to lack of focus, which can cause fear and the inability to get things done. Set your intentions. While I’ll never be labeled a poster child for getting up early, I do know the power of morning meditation and/or exercise. By taking 5-30 minutes to prepare your brain and body for what you want to have, you subconsciously establish the foundation for your day. This doesn’t mean people and things won’t show up disguised as a rain cloud, but it does mean your chances of getting drenched are decreased because you started your day under an umbrella! Listen to a podcast. There’s nothing like seasoning your day with words of inspiration, motivation, and even humor. In most work places, you can wear earbuds while working, so why not take advantage of this and fill your head and heart with words that will put your mind in a better state of being? Also, the Bible says, “A cheerful heart is good medicine, but a broken spirit saps a person’s strength.” (NLT) Have you ever been in a foul mood, then something funny happens which causes you to laugh? Don’t you instantly feel better afterwards, even though the situation may not be resolved? Exactly! Finding a funny podcast can be just the medicine you need to break up the day’s tension. Take regular stress breaks. If you’re a non-exempt employee in the United States, you’re typically required by law to take small breaks throughout the day. However, what if you’re an exempt employee or work in a country where this isn’t a legal requirement? The good news is your breaks don’t have to be 15-20 minutes in length to be effective. They can be as short as one minute to stand at your desk and stretch. You would be amazed at the impact on your stress level a one-minute stretch break can have. Now, if possible, add four more minutes and take a quick walk to stretch your legs and clear your mind. When you return, you’ll feel better and be more productive. Connect with a work friend. In every organization I worked for, I ALWAYS had at least one friend at work, and you should too. This may not be someone you hang out with on the weekends, but it is the person with whom you can talk, laugh, and vent. Having a ‘partner in crime’ at work can make a tremendous difference in the quality of your work experience and stress level. It may take time to find this person (or these people), but he or she will be well worth the effort! Put things in their proper perspective. I once worked for a pet food company. During one intense meeting, a colleague made a brilliant observation which changed the trajectory of the meeting. She said, “Folks, this is just kibble in a bag. It’s not that serious.” She was right. While we all took our work seriously (and so did our bosses! ), there was nothing we were working on that could destroy the world. Of course, if you work in healthcare or as a public servant in law enforcement, fire, or the like, this doesn’t necessarily apply. However, even in these fields, not every task requires intense scrutiny and stress in order to complete it. Learn to pick and choose your stress battles wisely. By incorporating these simple changes into your daily work routine, they can make the difference between a fantastic 2019 or another stressful year. Bernie Frazier, SPHR is the Founder and President of CAREERCompass, LLC, a speaking and career coaching firm based in St. Louis, MO. She also spent almost 25 years recruiting talent to six organizations across four industries, and led the Talent Acquisition function for four of those organizations, including one global team. Bernie holds a bachelor’s degree in Marketing from Drake University in Des Moines, IA and is a Senior Professional in Human Resources. In her spare time, she volunteers as a Board Member for It’s Your Birthday, Inc., and teaches job skills classes for local nonprofit organizations. To learn more about Bernie and CAREERCompass, please visit her website at www.CAREERCompassLLC.com.